I’ve seen several therapists in the past, and none of them talked about CEN with me. My therapist talks about Emotional Neglect, but does not seem to have the same picture of it that you describe in Running on Empty. My therapist doesn’t seem to understand what I mean when I talk about Childhood Emotional Neglect. Can you please help me find a CEN specialist near me? 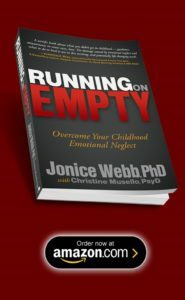 My book, Running on Empty: Overcome Your Childhood Emotional Neglect came out in 2012. Since then, I have enjoyed hearing from hundreds of readers. Each week, I get multiple letters and emails from readers telling me their stories, or asking questions about Childhood Emotional Neglect. Often the messages are from people who read the book and feel that they finally can see the underlying cause of their struggles. Many of these folks have been in therapy in the past and found it helpful, but felt that an important piece was not addressed; their Childhood Emotional Neglect (CEN). The questions and comments above are ones which I have heard from literally hundreds of people. Although almost every therapist understands the concept of Emotional Neglect, most do not necessarily use the term Emotional Neglect to describe it. There still is not a recognized, universal term. Since there is not yet a body of research proving the full picture of CEN, most mental health professionals do not necessarily see that full picture as it is described in the book. Until I have that research, Running on Empty is the only resource describing CEN fully. If your therapist has not read the book, he or she probably will not have the entire concept in mind. 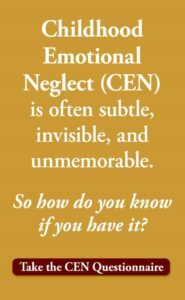 This is why so many therapists seem to understand what you mean when you use the term Emotional Neglect, but then don’t talk about it directly or fully as treatment progresses. 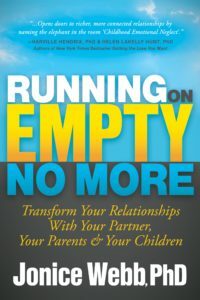 Here’s the good news: Any well-trained, competent therapist who is open to reading Running on Empty will be able to quickly jump on board and help you with it. Start with a therapist who has good credentials, experience and/or a recommendation from a trusted source. If you are interested in doing the recovery exercises in the second half of the book, you might want to find a therapist who has skills in the cognitive-behavioral area. However, a therapist who describes herself as a “behaviorist” would probably not be a good match for this. Ask the therapist if he/she will be willing to read the book, including the ‘For the Therapist’ chapter. If all systems are go, then take a copy of the book to your first appointment. At your first appointment, try to describe why this way of understanding yourself is helpful, and why other things you’ve tried have missed the mark. If you feel in the first meeting that the therapist isn’t fully on board, try another one. Seeing a therapist once does not obligate you to go back. I hope you find these tips useful. And I hope you will not hold back from getting help with this. It’s possible to heal yourself, but it can be much easier with the support and guidance of a professional who truly understands what you are going through and how to mend it. If you are feeling overwhelmed by this process or a bit at-sea, you can request a one-hour phone or Skype consult between your therapist and me (if your therapist is willing, of course). To learn more about scheduling a consult, please visit my Private Practice page. I would like to find a CEN psychotherapist with a Doctorate degree. I live In Saint Clair, Michigan 48079. I would also need them to be participating in Medicare. If you can provide with someone who has the academia to address CEN issues it would be appreciated. This clearly describes my past. Dad a loner, neglected both us girls, but unintentionally, just passed away recently. Mother very strong, very strong-willed, hardly ever admits wrongs, to be wrong. But emotional neglected us both. No time spent with us, training, playing, teaching. Howevever, they both took US TO CHURCH EVERY SUNDAY. COME RAIN OR SHINE. CAMPS, PLENTY, PLENTY OF JESUS TIME. I am looking for a therapist in the Seattle area for my Son. Can you please direct me to someone. My son is 28 years of age and is struggling with what he thinks may be CEN. As his parents we are shocked and want to help him. I’m not sure if this is important but he is adopted and has been ours since birth. Thank you for any information you can send me in this regard. He does have your book “running on empty” which I am planning on reading as well. Did you find a therapist? I am also in seattle and looking for a therapist here. I’m in Seattle too and looking for CEN counselor. Can you refer? Thank you, for writing RUNNING ON EMPTY. I had come to the same conclusions, on my own, that things were neglected in my childhood. But I could not explain why, or how. Just the validation of my own insights has been extremely therapeutic. I can’t wait to begin applying some of the recovery exercises.